THERE ARE TIMES when we have to tell ourselves it is okay if we take a timeout from worrying about the fate of the world. While the war in the Balkans rages, it is hard to think of much else. But as bad as that might be, I must confess to being distracted from it by the sound of the two most beautiful words in the English language: opening day. There are those who believe sports is an unworthy preoccupation for a Jewish adult. True, baseball cannot claim to outrank Torah study, giving tzedekah or even political activism as worthy endeavors. But baseball has been an integral part of the American Jewish experience from the beginnings of the sport. It was more than just trying to assimilate. Being an American required diving into the maelstrom of everyday life: working, voting and yes, playing American games --- especially the national pastime, baseball. In a famous exchange with a reader of the Yiddish Forward newspaper's "Bintel Brief" a century ago, the paper's editor urged a parent to let his child play the "wild American game" of baseball. "Don't let your child grow up a stranger in his own country," the editor urged. Despite the European shtetl's tradition of denigrating sports, it was taken to heart by most immigrant Jewish kids, if not their parents. And while we were assimilating ourselves into American culture via baseball, we also managed to assimilate baseball into Jewish culture. Everywhere we have lived in this country, Jewish communities managed to take local teams to their hearts and bind the team's identity into our own particular world view. For the most part, that meant that immigrant Jews who had arrived on these shores as underdogs despised by the ruling elites in the new land as well as the old tended to identify with unsuccessful teams. Baseball is a game that can break your heart, and to a people whose history has had more than its share of sadness, it was a perfect fit. In Philadelphia, that created a tradition of rooting for the Phillies as opposed to the more upscale (and generally more successful in the early part of this century) A's. In Boston, it often meant a love for the downtrodden Braves (who, like the A's, departed their original home for greener pastures in the 1950s) rather than Red Sox. In New York, rooting for the Brooklyn Dodgers (who in 1947 were the first to break baseball's despicable color line) was depicted as a blow struck for a progressive society. Especially when placed against the notion of rooting for the Yankees, who were seen by some as the baseball incarnation of an inhumane and intolerant ruling class! Even today, long after the Dodgers abandoned Brooklyn and became the epitome of the Southern Californian lifestyle, you can run into old-timers who will try to sell you on the idea that rooting for the Bums was somehow Jewish, while supporting the Bronx Bombers was a non-Jewish thing to do. As comforting as these myths about our teams might be to some, they are, of course, pure bunk. There really wasn't anything much that was Jewish or non-Jewish about any major-league team. But the fact that it made us feel more at home here to think them so is an interesting facet of the unique American Jewish capacity to synthesize American ideas into Jewish thought patterns. The most outstanding example of this phenomenon was in Detroit, where the Tigers were led by the man who was arguably the greatest Jewish player of all time: Hammerin' Hank Greenberg, who played during the 1930s and '40s. It is hard for us to imagine how important Greenberg's achievement was to American Jews at the time. For Tiger fans, as well as Jews everywhere, the exploits of the Bronx-born Greenberg were a rare source of pride during the worst period in Jewish history. He earned a special place in the pantheon of American Jewish history with his decision not to play ball in a crucial game in the 1934 world series because it fell on Yom Kippur. 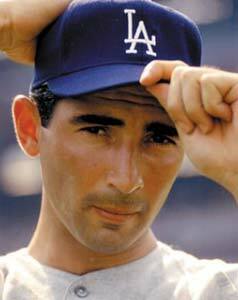 It was a precedent that was matched by Dodger great Sandy Koufax, who similarly refused to pitch the opening game of the 1965 World Series on Yom Kippur. Fittingly, these two -- who proved to the nation that one could remain faithful to Jewish identity while being proud baseball heroes -- remain the only Jews who have, to date, been inducted into the National Baseball Hall of Fame in Cooperstown, N.Y.
Greenberg's exploits have been retold in a movie made by documentary filmmaker Aviva Kempner (whose previous work includes the excellent "Partisans of Vilna") called the "Life and Times of Hank Greenberg." Kempner's film retells Greenberg's story, but also places it in the context of the fond remembrances of Detroit Jews for "their" Tigers. Kempner holds to the theory that the Yankees were the "anti-Semitic" team because of the abuse they hurled at Greenberg and his teammate pitcher Harry Eisenstat. But she forgets that "bench jockeying" as the practice of insulting opposing players is called, went both ways. While the Yankees were abusing the Tigers, the Detroit team were screaming anti-Italian insults at the Yanks who were known as the Italian team in the American League of that era because of their stars Joe DiMaggio, Tony Lazzeri, Phil Rizzuto and Frankie Crosetti. One myth about Greenberg needs to be put to rest. Contrary to the memories of some fans of the era, rival American League teams did not refuse to pitch to Hank when he challenged Bath Ruth's home run record in 1938 because of anti-Semitism. 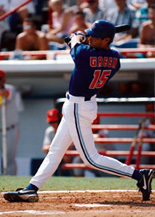 Greenberg admitted himself that he was given plenty of opportunities to match the Babe's magic number of 60, but wasn't able to do it. But before we place Green on a Jewish pedestal alongside Tamir Goodman, the observant high school basketball ace from Baltimore, I will merely note that I checked the box score from the game Toronto played last Yom Kippur and sadly noted Green's presence. As for the Yankees, it's time to dispel the myth that no Jews rooted for them, a falsehood that even as eminent a thinker as author Dennis Prager asserted to me in a conversation last year. The list of famous Jewish fans who have chosen to identify more with excellence than failure is long, and includes famous singers and Yankee rooters like Richard Tucker and Robert Merrill. Another example is author David Horowitz. His book Radical Son, which tells the tale of his journey from the far left as a "Red Diaper Baby" to the present-day political right, includes a wonderful passage about journeying to Yankee Stadium to see Joe DiMaggio win the pennant for the Yanks at the expense of the Red Sox in 1949. My own baseball allegiance stems from an incident that took place in the early 1920s - long before I was born. It was the day my own father met Babe Ruth, who paid a visit to the Jewish Orphans Asylum on Manhattan's Upper West Side where my dad was raised. He can remember to this day the Babe's warmth and generosity to the kids there. He even gave my father a signed baseball. Unfortunately, since it was the only ball he owned, it was played with and eventually lost - depriving my family of a valuable heirloom. Whether baseball loyalty is more often passed on via matrilineal (like traditional Jewish identity) or patrilineal (the Reform movement theory) descent is a question for more extensive research. Nevertheless, my father's loyalty was to the Yanks alone, from that day with the Babe onward, and he passed it on to me and my sisters. The Yankees haven't had many Jewish players (one exception was Ron "Boomer" Blomberg, who is remembered most for his having the distinction of being the first designated hitter in baseball history), but that has been more than made up for in my own mind by the Yankees' wise decision to bring a certified-kosher hot-dog stand to the stadium, something only a few other teams have done. Okay, so there is nothing particularly Jewish about baseball or even some teams. But I still believe that as long as Jews live on these shores, we will be playing and thinking about America's national game. The return of baseball every spring is like the coming of Passover: a sign of continuity and life.